London – Feb. 22 2018 – Saudi Arabia’s Minister of Energy, Industry & Mineral Resources, H.E. Khalid Al Falih, was presented with the ‘International Oil Diplomacy Person of the Year 2017’ Award at the Energy Institute’s International Petroleum (IP) Week on Feb. 22nd in London. The selection of H.E. Al-Falih came in appreciation and recognition of the pivotal role the energy minister of Saudi Arabia played through 2017 in shepherding the implementation of the Vienna Agreement to cut global oil supply, which played a seminal role in eroding record inventories and pushing oil prices to consolidate above $60 a barrel. His Excellency, who remains Chairman of the Joint Ministerial Monitoring Committee for the OPEC non-OPEC Vienna Agreement, said he was “flattered” to receive the accolade. “In the last year we have seen H.E. Al Falih re-establish Saudi Arabia as the driving force in the global oil industry, and in doing so we have clearly moved from the era of Al-Naimi to the era of Al Falih,” said Sean Evers, Managing Partner, Gulf Intelligence. H.E. Adeeb Y. Al-Aama, Saudi Arabia’s Governor of OPEC received the award on behalf of H.E. Al Falih. The prestigious Award, which is presented annually by the U.K.’s Energy Institute and Gulf Intelligence, is also in recognition of the leadership displayed by H.E. Al-Falih in guiding some 20 producing countries from around the world to find common purpose in cooperation to reach over 100% compliance with cuts and extend the oil supply pact for a second year through to the end of 2018. 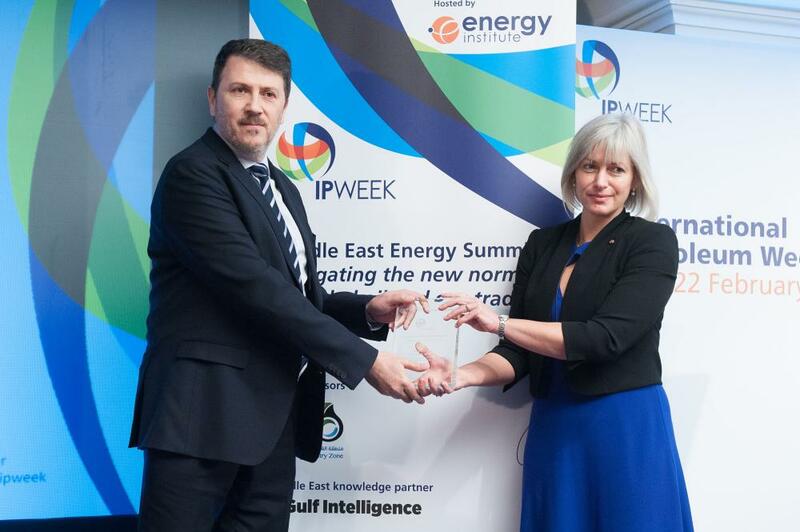 The Energy Institute, the host of IP Week, is the largest Royal Charter international professional membership organization and learned society concerned solely with energy, with Her Majesty the Queen as its Patron. IP Week is recognized as one of the major international oil and gas events, where senior leaders, policymakers, and academics gather to share, learn and shape the future direction of the industry. IP Week has a global appeal, attracting delegates from over 50 countries and it is one of the major events in the oil and gas industry’s calendar. On January 1st, 2017, after almost a year of shuttle diplomacy, OPEC and non-OPEC producers reached their first deal since 2001 to reduce oil output jointly by almost 1.8 million barrels a day. The accord ended a record global oil glut after more than two years of low crude prices that overstretched many state budgets. Oil prices, which fell below $30 a barrel in 2016, have since more than doubled to almost $70 a barrel.